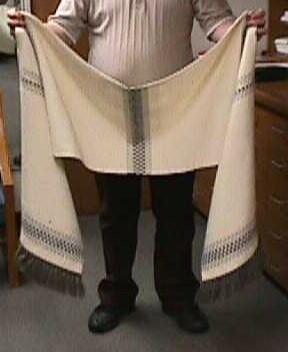 is a rectangular cloth worn over the shoulders of a vested priest or deacon and clasped at the front. It appears briefly in the liturgy when the blessed sacrament is venerated or transported some distance. Many veils have pockets where the minister inserts his hands before grasping the monstrance or ciborium. The custom honored the desire to revere sacred objects by not directly touching them. over his other vestments to carry the Eucharist from the tabernacle to the place of exposition at the beginning of the ceremony and while making the sign of the cross over the people with the monstrance or ciborium near the end. crated communion breads from the altar to the tabernacle. 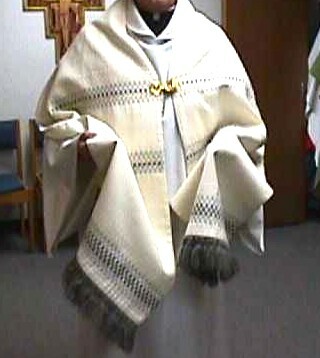 The priest wears the humeral veil while carrying and positioning the sacred vessels. 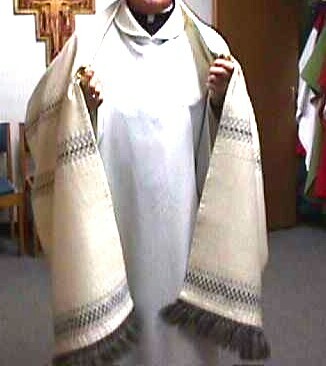 The humeral veil is also worn while carrying the blessed sacrament in outdoor eucharistic processions. When a new church and altar are dedicated, the blessed sacrament chapel is inaugurated after communion. The bishop wears the humeral veil to carry the Eucharist from the altar to the tabernacle. Prior to the Second Vatican Council, the veil was worn to bring viaticum to the dying, but the liturgy no longer calls for this. The word "humeral" comes from the Latin word umerus, meaning the shoulder or upper arm.